"It’s great to see advisors increasing their use of integrations and maximizing the value of their technology investments." SAN FRANCISCO--(BUSINESS WIRE)--Schwab Intelligent Technologies today announced that portfolio rebalancing provider Morningstar Total Rebalance Expert (TRX) and client portal provider ModestSpark will participate in Schwab OpenView Gateway, the flexible, open-architecture technology platform that enables integration between Charles Schwab custody and Schwab Performance Technologies® (SPT) portfolio management systems and select technology providers that support independent registered investment advisors (RIAs). Five years since its debut, Schwab OpenView Gateway is used by more than 9,850 professionals at more than 2,500 RIA firms. With these two additions, Schwab OpenView Gateway now facilitates 18 different types of integrations from 12 participating technology providers spanning client relationship management (CRM) systems, portfolio management and reporting, trading and rebalancing, financial planning and now client portals. Morningstar Total Rebalance Expert (TRX) provides automated, tax-efficient rebalancing to simplify and enhance portfolio management. This integration will allow advisors to automatically submit trades to accounts custodied with Schwab, removing the need to manually export and import trades from TRX to the custody system. ModestSpark offers a web-based and mobile client portal that enables advisors to provide a dynamic online client experience with direct access to portfolio information and reports. This integration will allow advisors using PortfolioCenter Hosted or Portfolio Services to automatically update portfolio management data in the client portal. ModestSpark serves more than 600 advisory firms, 70 percent of whom custody assets with Schwab. Additionally, Redtail Technology’s ® CRM, announced last year as a new Schwab OpenView Gateway participant, is now in pilot. Redtail provides web-based CRM software designed for the advisor market and is itself integrated with many of the industry’s most widely used applications. The integration with Schwab OpenView Gateway will bring Schwab custody balances and positions directly into the CRM, allowing advisors to quickly view and leverage the data in native Redtail features and functionality. Schwab Intelligent Technologies is also working to bring the power of integration to large RIAs that operate proprietary technologies. Through personalized integration consultation, Schwab Intelligent Technologies is enabling these firms to realize efficiencies in much the same way that Schwab OpenView Gateway participants are able to do with brand name solutions. Integration with SS&C Advent’s Black Diamond ® platform is being enhanced for the third generation Black Diamond wealth platform, which encompasses portfolio management, reporting, client communications, rebalancing and more. Single sign-on capabilities will also be expanded, allowing advisors to access Schwab Advisor Center pages and functionality directly from the Black Diamond wealth platform. Single sign-on capabilities are being expanded for Junxure Cloud CRM to enable advisors to access more information on Schwab Advisor Center, including research and alerts, directly from the CRM screen. Enhanced integration with Orion Advisor Services will enable secure, real-time access to cost basis data from Schwab Advisor Center®. Schwab OpenView MarketSquare ®, a website that provides advisors with peer ratings and reviews on technology solutions, including 74 RIA-focused applications and services. Schwab OpenView Workflow Library provides comprehensive prepackaged best practices for automating and standardizing key tasks. There have been more than 22,400 downloads from the Library since inception. Schwab Intelligent Technologies is focused on delivering the next generation of intelligent integration solutions for independent registered investment advisors. 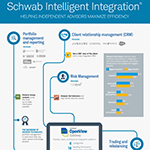 Schwab Intelligent Integration increases integration between disparate systems and workflows in advisors’ offices. Schwab OpenView MarketSquare®, Schwab OpenView Gateway™ and the Schwab OpenView Workflow Library® are products of Schwab Intelligent Technologies®. More information is available at www.schwabintelligenttechnologies.com. More information is available at http://www.aboutschwab.com. Follow us on Twitter, Facebook, YouTube, and LinkedIn. Schwab Intelligent Technologies today announced that portfolio rebalancing provider Morningstar Total Rebalance Expert (TRX) and client portal provider ModestSpark will participate in Schwab OpenView Gateway, the flexible, open-architecture technology platform that enables integration between Charles Schwab custody and Schwab Performance Technologies(R) (SPT) portfolio management systems and select technology providers that support independent registered investment advisors (RIAs).